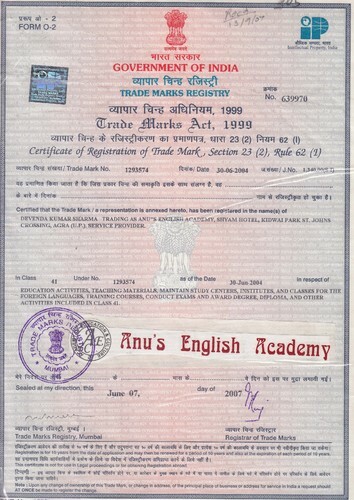 Anu’s English Academy TM is registered trademark under trade marks act 1999 in class 41 under No. 1293574 on the date of 30 June 2004. In class 41 Anu’s English Academy is allowed Education activities, teaching materials, maintain study centres, institutes and classes for foreign languages, Training courses, conduct exams and Award Degree, Diploma and other activities included in class 41. 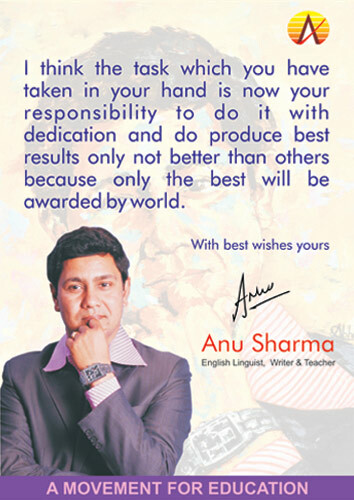 Anu’s English Academy is working under the aegis of Institute of Education Culture Society Agra (Regd.) Registration No. is 153/1998-99. This society is working for Education Field since last twelve year. This society organise free camp, seminar for poors in slum, villages etc.